Synopsis: Giant robot is disguised as Godzilla used by aliens to take over the Earth. The real Godzilla must fight against him with new ally, King Caesar. Any time that a new character or villain is introduced to the Godzilla franchise is cause for celebration in my opinion. As the series has gone through the Showa series, it has become increasingly dependent on tired story lines, stock footage, and music, as well as some rather questionable costume design. Reading more into it, it seems that the Toho studio that produces the Godzilla movies was truly going through some harsh times during the late 60's and the 70's leading to the diminished quality of its output during this time. What GODZILLA VS. MECHAGODZILLA has going for it, much like GODZILLA VS. HEDORAH, is the groovy 70’s tone, which reminded me of James Bond movies of the time. Plus, the film has new characters added to the roster of rotating kaijus that either fight or aid Godzilla. The big mystery focuses around this rather aggressive Godzilla that has popped up and started fighting his buddy, Anguiras, in an uncharacteristically brutal way where he pries his jaw open, leaving it dangling and bloody. Obviously, this Godzilla is different and more sinister than the heroic reptile depicted in the last few movies. In addition, there's a subplot with various humans about a prophecy. Here's an excerpt thanks to the Godzilla Wiki, "When a black mountain appears in the skies above the clouds, a monster will arrive and attempt to destroy the world. However, if this divination comes true, a red moon will set, two suns will arise (one being an optical illusion rising from the west), and two monsters will fight off evil to rescue the world." Between the new Godzilla and this prophecy, we have a group of humans that are running around and not really doing much of anything except commenting on the events of the movie. Towards the end, they get to fight the Simeons a little bit, but nothing noteworthy. I liked the fact that that writers, Jun Fukuda and Masami Fukushima, brought in a small aspect of the older Japanese culture with both this little prophecy and the new heroic character, King Caesar. The plot reveals itself to be another covert alien invasion story where, once again, Earth is being invaded by evil aliens disguised as humans referred to as Simeons. Whereas in the past the aliens would have just called up Gigan and Ghidorah as the agents of destruction, the Simeons say, "Screw it, we're building our own Godzilla!" Obviously, the role of MechaGodzilla is to destroy the original, but I thought that he honestly worked a little bit more as an impostor Godzilla. 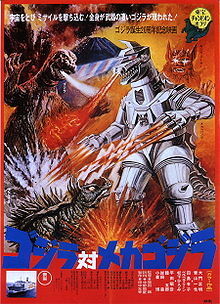 I think that there was some very interesting territory that could have been explored, but MechaGodzilla sheds his synthetic skin really early in the first battle of against the real Godzilla. Rainbow lasers that match Godzilla's beam. Space Titanium strength, which he displays when knocks King Caesar out easily. Crazy red lightning beam that comes out of his chest. Missiles just about everywhere: toes, fingers, and knees. This arsenal leads to one of the bloodiest battles yet. In fact, I really was a little put off that it's such a bloody movie. I'm not really the queasy type, but it just felt a little off to me. I actually thought it was really interesting that the very iconic MechaGodzilla was originally a decoy. He is one of the most famous Godzilla characters, and I can see why he has stuck around. I wanted to see more of this character immediately! In an allegorical sense, I was a little curious to see what MechaGodzilla represented, but apart from a nationalistic fear of technology or of hidden enemies, I couldn't really find much context for him, if he was even intended to have one. While, MechaGodzilla was cool, I also enjoyed being introduced to King Caesar, one of the most unique kaijus yet. He is the protector of the Okinawa temple and has what can only be called the most badass introduction of a character yet. At this point in the movie, MechaGodzilla is coming to the Okinawa temple in order to destroy Caesar while he is asleep, so one of the priestess busts out in one of the sickest jams in the entire series. I mean, I want an MP3 of the soundtrack, but it was a very dramatic and orchestral music along with the priestess' vocals, which were rather impressing. Caesar's design is very unique in just how much more agile he appears and his...canine/feline/bat-like (?) features give him a very interesting look to him. My friend Ichab0d was saying that he is inspired by the traditional lion statues that you'll see in various temples around Asia. I seriously thought he was a dog-bat hybrid, but that's just me. Mentioning the music, the new music by Masaru Sato was some of the best music of the franchise so far. Much like the music of HEDORAH, it had more of a funky tone during the human scenes, and it helped drive the action forward during the final battle scene. On yet another technological aspect, the camera work for this movie was much more dynamic than in previous movies, and it sure adds a lot to the action. One of my favorite shots is when MechaGodzilla is surrounded by Godzilla and Caesar and the camera pans around MechaGodzillla to show him shooting both of them with different weapons from his body at the same time. Also, the special effects in this movie seem to have been improved which you can see especially whenever MechaGodzilla is on screen when he shoots his Rainbow Lasers. The choreography of the monsters was also more human, which has bothered me a little bit in the past, but in this movie it works a lot better. Despite all odds, I was really into the movie. It took a familiar plot and made it feel fresh again by just tweaking a few pieces of the formula. The Showa series is about to be wrapping up next week with THE TERROR OF MECHAGODZILLA, and I'm interested to see not only how it ends, but also what the hiatus does for Godzilla as a series. Look for it next Tuesday!